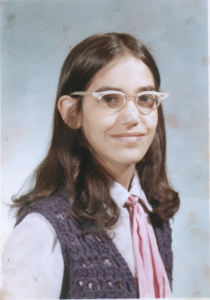 I became the girls’ math champion in my fourth-grade class at Hampton Elementary School in Detroit, Mich. Dean Philo was the boys’ champ and we were to face off the following day to determine the best math student in the class. What I wouldn't give for those glasses now. I loved Dean Philo. He was cute and just as smart as I was in math. I ran home beside myself with joy that not only had I won the girls’ championship but I also had the honor of competing against my boy crush. What? My mother meant well. She gave me protective advice based on 40 years of experience observing gender dynamics. She was right, especially in 1968. With that simple sentence, my mother told me not to win. Even if I could run concentric circles around Dean Philo, I should lose. Carl Jung, the founder of analytic psychology, would say that I tucked that tidbit into my shadow – that place where we stuff those personality traits deemed unacceptable by our communities, our families, ourselves. My desire to win didn’t go away. It just slipped into a cave somewhere in my psyche. Unfortunately, shadow material left to its own devices will devolve – become ugly. One of the ways it manifests is through projection onto something outside of itself. Since the 2016 presidential race, I wonder about the connection between warnings like my mother’s and the 42% of women who voted against Hillary Clinton. I wonder how many of those women were little girls who stuffed their power into their shadows only to project that unacceptable part of themselves onto Hillary. Having an unreasonably strong reaction to someone you don’t know is a clue to what is buried. By rallying and voting against a woman who dared to be powerful, were they projecting the power that they or someone else deemed unacceptable? Were they trying to manage the anxiety that Hillary’s power triggered in their own shadows? I wish I could say I shunned my mother’s advice and beat Dean Philo that day. But honestly, I don’t remember the outcome. That, too, was buried. Tell me about the messages you received as a child regarding the power of women and girls. Were you encouraged to shine your light or advised to stay in the shadows? Very thought provoking. I was one of those women who initially felt I could not vote for Hillary in the primaries. I was very aware of the need to really examine why I felt the way I did about her–what was it that made me not want to trust her. I made a conscience effort to reflect about my own feelings and trust level regarding powerful women and about my own feelings of self efficacy regarding power or powerlessness. I would have voted for another woman, say Elizabeth Warren, in a heartbeat. But Elizabeth Warren wasn’t being put through the wringer in the same way Hillary was, at least not at that time, and I did eventually come to see how I was falling for propaganda. I had no trouble voting for her in the election but realize I was seen as a traitor by those still falling for the propaganda. Nicely done! This is, obviously, old news for me, but you’ve managed to tell it with a light, but deft touch. That’s because you write so well. I love the Blog. It seems informative without being preachy or exclusive (No Men allowed!) I’ll have to keep reading. How often do you post? I don’t like the idea that fear makes us flood our new experiences with warnings gleaned from old ones. It makes it difficult to see new experiences clearly. Everything is colored to some extent with fear. Crap. Awareness of the phenomenon can help a bit. I hope. Ciao-ciao. OMG. You were so beautiful, even in 4th grade! I’d forgotten about this picture. I wonder what Dean Philo looks like now? An unfair question.